Mine the precious 5 reel diamonds from the bottom of the online slot games and carve yourself some handsome deals today. 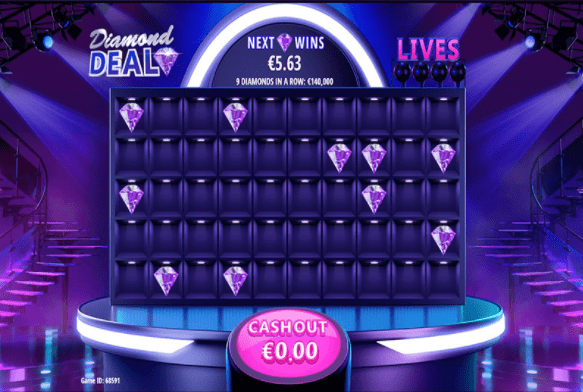 This slot game comes with a gameshow aesthetic that’s not to be missed, spin the reel and match diamonds of varying colours to earn some free spins and significant cash rewards at Wizard Slots. Feel free to check out the slots here. Gamevy is a very recent company on the market as it was only founded in 2013. Even though they have only been around for four years they already have a very nice selection of revolutionary games. They deliver high-quality games, with consistent polished art and game design. Their products offer entertainment and engaging features and games where player choices or skills really matter. Gamevy provides completely different games to anything else in the real-money market, developing engaging and unique gameplay experiences for their audience. You can play slot games with free spins from Gamevy here. Diamond Deal is absolutely gorgeous and shiny, just like the name already suggests. Everything in this game is about the woman's best friend - diamonds. The setting is a game show, in the background, you see some very nice glass stairs for the contestants to walk down from and spotlights hang on the roof to bring everything in a prettier light. The entire game shares a blue, purple, pink and silver colour palette. Everything in this game looks very luxurious and shines bright like a diamond. Read about this game's features and bonuses to know why it's one of the best online slots you can play. The game you are to play in this show is very simple. You have 50 blue glowing squares in front of you, 10 of them hide a diamond. Pick the squares, you think to hide the precious gem but be very careful about your choice as you only have four lives. On the right upper corner of the squares, you will see four light bulbs, if you fail a pick one of them will turn off, when the last light bulb goes out you lose all your winnings and go home empty-handed. If you do find a diamond, however, your lives will be fully restored. In the middle on top of the squares, you will see the amount you can win if you find a diamond with the next pick. For every wrong pick the value will decrease and for every diamond found the prize will increase. You can choose to cash out anytime when you are happy with your winnings and don´t want to risk them. At the start of each game, you will see a little menu in the middle of the screen where you can place your bet anywhere between 1 pound and up to 10 pounds. Once you set the bet and hit the play button you can either choose to pick every square yourself and enjoy this pretty game in its fullest or you can decide to just sit back, relax and let the game do everything for you by pressing the quick pick button. Diamond Deal is beautiful in every sense. The aesthetics are mesmerizing with a lot of shiny details and the gameplay is engaging and fun. Be part of this entertaining game show, discover all of the ten shiny diamonds that are hidden behind the squares and feel like a star in the middle of the spotlights when you carry home the big win. Diamond Deal has a soothing game feel and will draw you in with its intriguing gameplay experience.